Our approach to the 17 United Nations Sustainable Development Goals (SDGs) focuses on seven SDGs on which we have a direct impact or influence and which we have found to be highly material to our business. For an additional five SDGs, we have determined that we have direct or indirect influence but they are not ranked as highly on our materiality matrix. And, finally, for the five remaining goals, we have no notable influence or impact and they do not rank high on our materiality matrix, although we do still measure and report on some of the indicators. The UN Sustainable Development Goals (SDGs) are an important consideration in in association with our Materiality Study. For 2017, we have identified specific areas of alignment between our material topics and the SDGs. Readers can also find the link to the 17 SDG’s on our Goals page. 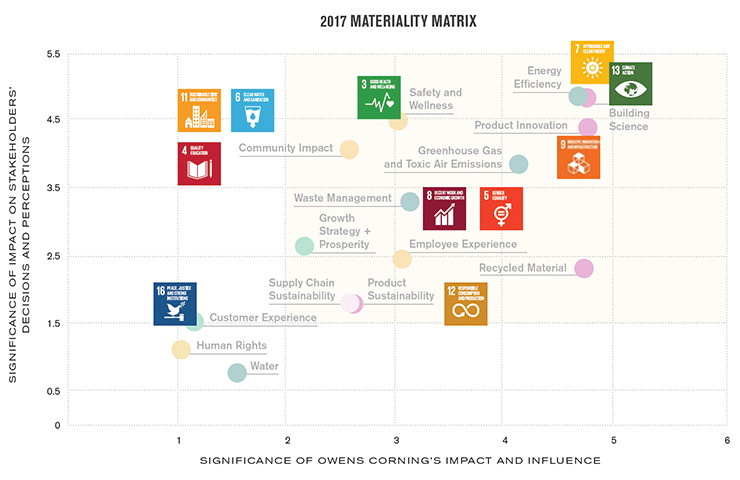 The SDGs where Owens Corning can have the most direct impact or influence, and are also material to our business, are identified by the icons that fall within the shaded box of Focused Reporting Topics: SDGs in that category are #3, #5, #7, #8, #9, #12, and #13. Additionally, SDGs #4, #6, #11, and #16 are areas in which we believe we have a lesser, and less direct, impact but nonetheless reflect our values, policies, and outreach work – and may also have a significant impact on stakeholders’ decisions and perceptions about our company. Note: The overlay of the SDG icons should be regarded as a general visual representation; it is not intended to place them exactly where they fit with all relevant material topics. Use the table that follows to understand the more specific connections between our material topics and the SDGs.